The University of Wyoming Art Museum will offer a four-session Friday morning preschool class Oct. 6, 13, 20 and 27 from 10-11 each day. 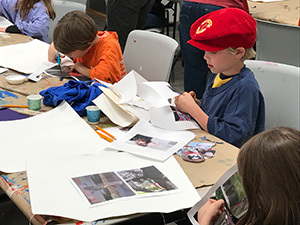 Each session will be led by the Art Museum’s trained teaching artists and educators to help preschool students explore a variety of materials to create unique works of art. The Art Museum’s October class is titled “Learning from the Cheech Marin Collection.” Students will be inspired by the exhibition “Papel Chicano Dos: Works on Paper from the Cheech Marin Collection,” and they will learn about why people collect art and how artists create work that inspires others. Each week, students will create a new work to add to their collection. The four-session class is $25 per student. Online registration is available at www.uwyo.edu/artmuseum/learn/prek-12_programs/upcoming-classes-events. For more information, contact Master Teacher Heather Bender at (307) 766-3515 or hbender1@uwyo.edu. Visit the Art Museum website at www.uwyo.edu/artmuseum, or follow the museum on Facebook.